Mountaineer and storyteller Katja Staartjes : “Are you looking for a keynote speaker for your organisation? My speech inspires and gives new perspectives on the challenges in daily life and work. With my experience as a mountaineer, expedition leader and manager I stimulate teams and individuals to develop and grow and being ready for the future. 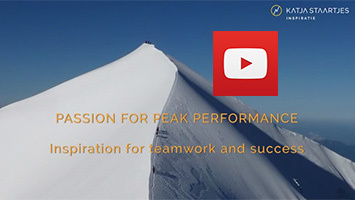 Important conditions for delivering peak performance are motivation and teamwork. True inspiration requires to make choices and to really go for it. But you can not succeed alone, so cooperation is crucial. Teamwork demands commitment to the common goal and trust within the group. My experiences in the Himalaya form a powerful metaphor to inspire your collegues to get the best out of themselves. And to stimulate teams to look how you can really achieve win-win possibilities and reach your common goals and the top. The story I tell and the impressive images I use during my speech make my words come to life. The comparison to climbing mountain peaks such as Mount Everest make your organisational issues tangible. I guarantee my story will inspire and has impact. If you are interested in a keynote speech that inspires, please complete the form or call Katja Staartjes (The Netherlands) at +31 6 212 742 82.